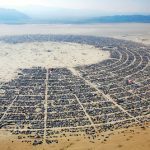 ART NEWS: Artist to build Temple in Northern Ireland for Burning Man. David Best, the artist behind the popular ornate temples at Nevada’s Burning Man Festival, has began crowdfunding for a similar structure in Ireland. The Temple, which will stand tall against the Irish city, will be made of recycled plywood. The structure hopes to change the perception of people towards huge group efforts. After construction, the temple will be opened to the public who are encouraged to bring mementos add personal messages to the temple. True to the Burning Man mores, the Temple will be burnt during a special ceremony. David has planned a two-week construction period for the building with a target opening date of March 2015. Artichoke are creative producers based in London, well known for their ground-breaking and ambitious work. Always outdoors and almost always free, their projects are dedicated to transforming public spaces with great art and changing the way people feel about their surroundings. Previous projects include The Sultan’s Elephant (2006), La Machine in Liverpool (2008), Peace Camp at coastal locations across the UK (2012) and Lumiere, the UK’s biggest light festival, which has taken place in Durham three times and last year was programmed to bring Derry’s year as UK City of Culture to a close. Over 180,000 visitors enjoyed light installations across the city in what was dubbed ‘the jewel in the crown’ of the year of cultural events, and this project marks the return of the company to the city. 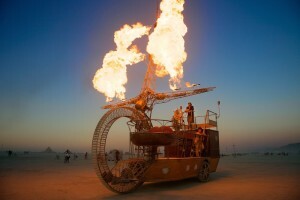 This entry was posted in NEWS and tagged burning Man, Burning Man Festival, David Best. Bookmark the permalink. 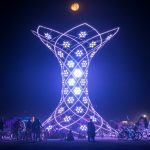 A 37ft interactive art installation called Ilumina from Burning Man. The Food of Burning Man. 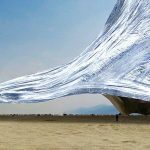 The Art Of Burning Man: Exhibition And Book.